Alexi Kaye Campbell's play, Apologia, presents a birthday celebration with little party spirit. In 2009, Kristen Miller (Stockard Channing), a bitter activist/art historian, born American but now living in an English countryside cottage, is waiting for her party guests. Expected are her grown sons, Peter and Simon (both played by Hugh Dancy) and their girlfriends and also her long-time best friend, Hugh (John Tillinger). Stockard Channing, as usual, becomes the focal point of most of her plays, and here she makes the most of her signature dry delivery, face fixed, eyes zero in on her prey. Even if the material she is given is not always worthy, Channing's depth and appeal gives it gravitas. Apologia is basically a family drama, insightful but rambling and talky, yet it still has Channing to captivate the viewer plus a winning supporting cast. Standing in the large all-purpose room designed by Dane Laffrey, drinking wine and waiting, a silent atmosphere of caustic defensiveness seems to be preparing her for the appearance of her sons who, she knows, still blame her for their problems. Backstory: Kristin was once an activist, dedicated to her causes, married with two sons and a husband who divorced her and won custody of the boys, aged seven and nine. Kristin sought to get them back but then decided to re-energize her activism and concentrate on becoming an art historian. World-renown, she recently published her memoirs but excluded any mention of her sons. This book is her "apologia," the written account of her conduct, and not an apology. The sons' resentment, and her defensiveness, permeates the play. Peter arrives first with his girlfriend Trudi (Talene Monahon), an American evangelical, which hardly clicks with Kristin who calls Christianity an " outmoded patriarchal propaganda." Also, their birthday present of an African mask is not met with the expected delight. With perfect passive-aggressiveness, Kristin denigrates it as insignificant and merely "decorative." Privately, Kristin comments to her son, "All those nice English girls and you show up with an American. It’s a little Oedipal, sweetheart." Later, Peter confides to Trudi, "She’s a bloody nightmare." Peter's younger, more sensitive brother, Simon, does not arrive until Act II. Emotionally damaged, he is now on the edge of a breakdown. His girlfriend, Claire (Megalyn Echikunwoke), arrives early and reveals that when Simon finished reading his mother's book, he threw it against the wall, crying, "Why did she have children?" Claire, a confident soup-opera actress is glamorously dressed by Anita Yavich and used to dealing with Kristin's barbed intelligence, honed sharper by wine. When she gives Kristin her gift, an upscale cosmetic cream, "Transformative Rejuvenation," Kristin's pal, Hugh, is ready with his own wry curiosity, quipping, "Just in the nick of time." Directed by Daniel Aukin, the play gradually builds with tension, characters talking over each other, letting personal grievances unravel and Kristin firm up her defensive carapace. This results in a play of self-explanations, complaints, provocations and no real conversation but plenty of spiked comments. 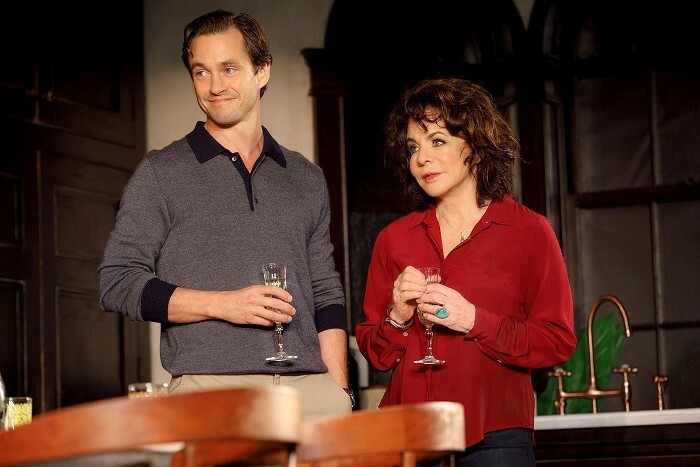 Hugh Dancy plays both sons persuasively. Peter's cool mask covers his feelings of love/hate. Simon, who finally turns up, having had a fall on glass, meets who now turns motherly, carefully removing glass shards from his hand. (Not so easy when the electricity is down in the cottage and Bradley King's stage lighting is dim.) This is the emotional heart of the play as Simon reveals his own story of how his mother disappointed him. Kristin is hurt but quickly ends the conversation. By the time they leave, even Kristin has to see that Claire and Trudi are proving to be sensitive and more intelligent than they first seem. They understand Kristin's "apologia" although she is still fiercely protective of her hard shell. It is a provocative and sad story with convincing characters but not surprisingly, Channing still stands out as the riveting center of the production.